You've had an argument and it got completely out of hand. It escalated into something personal, and then something hurtful. It's a good way to ruin relationships, and all the hurtful things that were said can be very hard to recover from. Force yourself to stay as calm as possible. Don't take any bait to react negatively, or explosively. You've had an argument and it got completely out of hand. It escalated into something personal, and then something hurtful. It's a good way to ruin relationships, and all the hurtful things that were said can be very hard to recover from. 1. Force yourself to stay as calm as possible. Don't take any bait to react negatively, or explosively. Take deep breaths (repeat: Breathe in, breathe out in your head). One of the reactive responses we take when we are upset is to hold our breath. Bad idea -- as this is the precise time we need oxygen in our head and we are holding back oxygen when we hold our breath. Remind yourself NEVER to say "Calm Down" to the other person. That is the equivalent of pouring gasoline on the fire. Even telling yourself to "calm down" is potentially causing a negative reaction. Repeat: Breathe in, breathe out. 2. Maintain eye contact and open body posture. This is not the time to look at the ceiling (rolling eyes), or look at the floor (chastised). We know that arms crossed across the chest mean many things, but in a tension-filled situation it will be interpreted as defensive and aggressive. Arms down, open body (don't close your stance). - When making eye contact with your partner, instead of looking into their eyes, look at the space where their eyebrows connect. We all do know that person that has that unibrow and that is where you should be looking. It gives the illusion of eye contact, yet it is distanced enough that we can maintain our composure during the conversation. It may make you laugh inside, but it helps you look like you are maintaining eye contact and that is important. 3. Bite your tongue. Avoid interrupting the other person if at all possible. The average explosion will last about 45 seconds - which is a huge amount of time to listen to someone yelling at you (repeat: Breathe in, breathe out during the explosion). However, if you interrupt them, they will get even angrier and we've caused the situation to escalate. Remember what it was like when you were a child and you said "But Mom..." It just got worse. Avoid responding to comments, even if they are wrong. Stay away from defensive behaviour. Let them vent. They are not reasonable at this point of the discussion and you are only wasting time and escalating the conversation further by responding or reacting to their comments. 4. Ask for a time out when they are finished. You can say, "This conversation is important to me, but right now I'm too emotional to finish it. I'm afraid that one of us will say something we can't take back. Let's talk about this in an hour after I gather my thoughts (or you can say after I calm down). Be firm. If they want to have the discussion now (and they will), be firm and repeat that "Now is not a good time for me. I need to gather my thoughts. Let's talk about this in an hour". Repeat this phrase as often as necessary without getting pulled into the argument again. 5. Focus on a solution. Don't focus on what they said, or on what you disagree with. Focus on how you can fix whatever is wrong. When you go back in an hour or so, hopefully, the situation has calmed down and is not nearly as escalated as before. Take the time to think about your solution, or what you want to say. 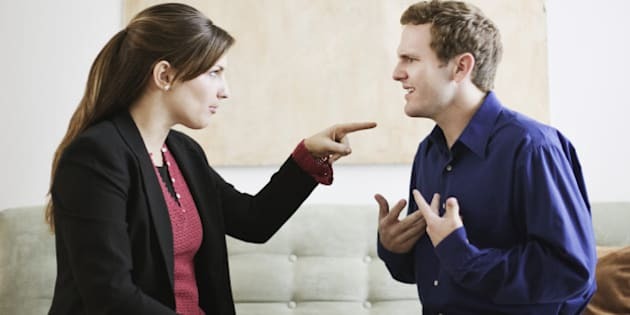 The most important reason for this time out break is to ensure that you don't allow the argument to escalate into a discussion that is personal and hurtful. Arguments and discussions are two very different things. Arguments focus on who is right, and discussions focus on what is right. We don't want an argument; we need a discussion. Keeping the discussion from escalating is your primary goal.